Large unbreakable container with rubber grip base which holds the device firmly in place. Advanced push to clean button which ensures easy and hygienic cleaning. Ergonomic grip handle for easy operation. Dishwasher safe for easy cleaning and maintenance. Large detachable container which can also be used to store vegetable and fruits in refrigerator. Colour: Green, Material: Plastic and Stainless Steel, Shape: Rectangle. 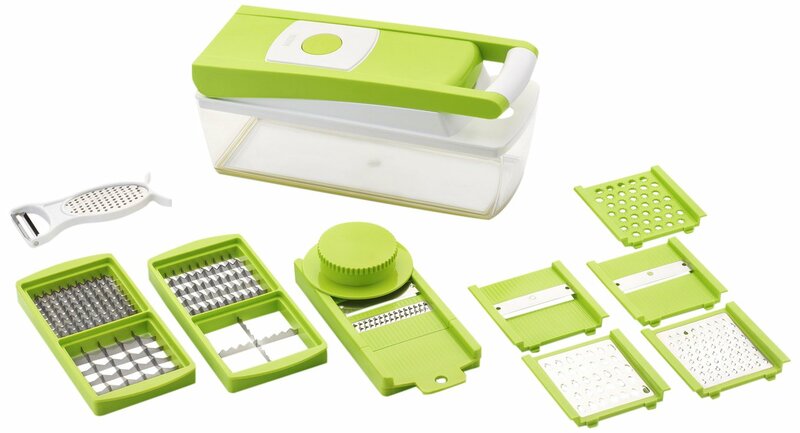 Package Contents: 1-Piece Plastic Container, 1-Piece dual blade (7mm x 7mm & 14mm x 14mm), 1-Piece dual blade (7mm x 14mm & 36mm x 36mm), 2-Piece slicer blades, 2-Pieces grater blade, 1-Piece peeler with grater, 1-Piece blade die attachment, 1-Piece Juliane blade, 1-Piece safety holder, 1-Piece masher and 1-Piece handle with cleaning press.